From supporting farmers to probing policy, Harvard people help Myanmar remake its future. Daw Than Than Sein, U Win Hlaing, and daughter Win Win Thu at their home in the Ayeyarwaddy River Delta village of Wakouktaw; Proximity Designs’ irrigation equipment has helped them expand their farm and boost their income significantly. Debbie Aung Din Taylor and Jim Taylor have built a social enterprise devoted to improving rural farmers’ lives—in some cases, literally by making their burdens lighter. 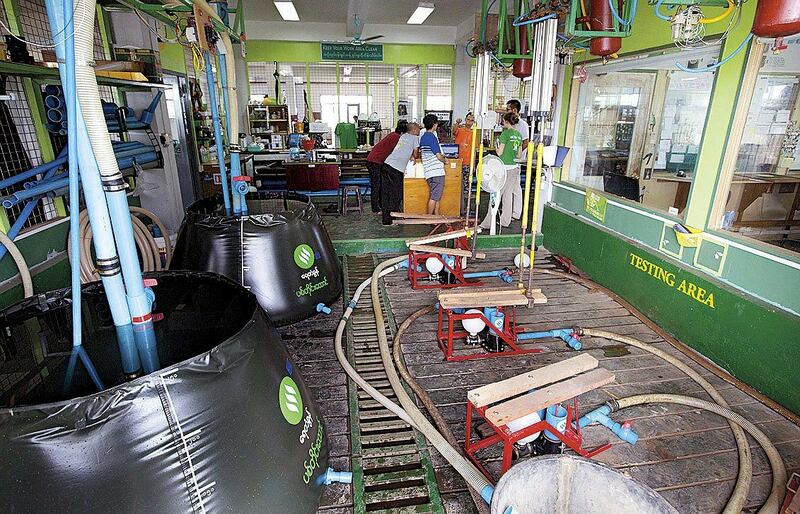 Testing Proximity Designs’ pumps and water baskets at its Yangon factory. 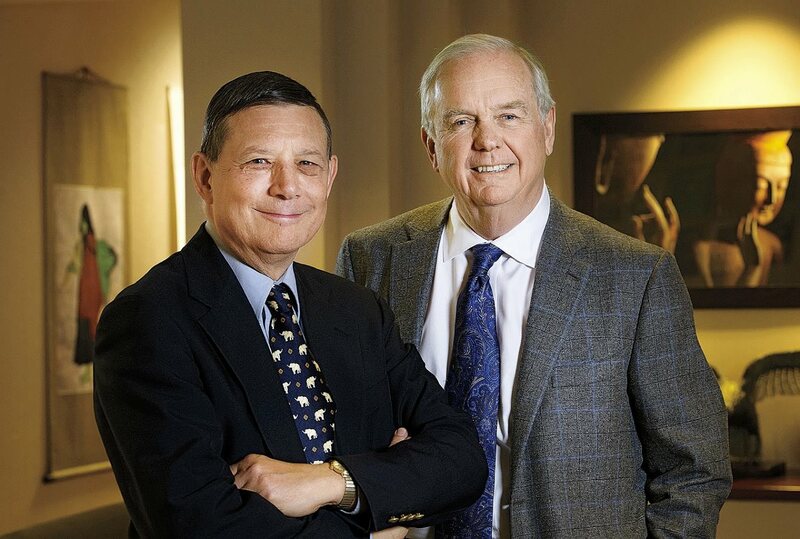 Like the Taylors, the Ash Center’s David Dapice and Thomas Vallely have for decades worked on Asian development and policy reform in challenging contexts. Proximity Designs sources parts from local workshops, like this one in northeastern Yangon. A shop in Kungyangon township displays Proximity pumps for sale. Debbie Taylor and residents of A Phaung Gyi and surrounding villages discuss credit, solar lights—and an alarming pest preying on the ripening rice crop. Most of Myanmar lacks electricity. A duck farmer in A Phaung Gyi improvised this diesel lamp before Proximity distributed low-cost solar lights, sold on installment. After Cyclone Nargis, aid funds distributed by Proximity boosted the economy and infrastructure, like this new, safer bridge in A Phaung Gyi. Hundreds of miles north of the delta, farmers in Myanmar’s Dry Zone, like these in Kangyikone village, grow peanuts as a cash crop—and rely on oxen for power. Proximity advisers are introducing practices like “green manure” plantings to enrich the soil. The sign details an infrastructure-aid project, managed by Proximity, to restore the village’s drinking-water pond. 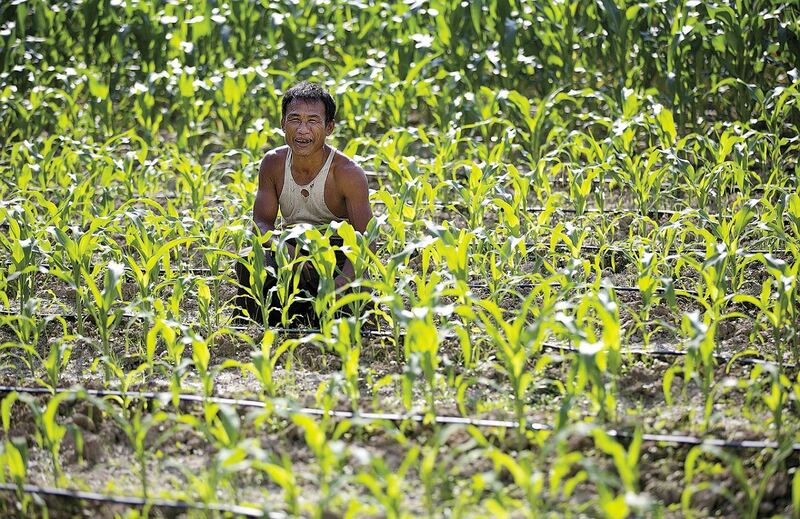 U Myat Thein, an entrepreneurial early adopter of new agricultural technologies, raises corn using Proximity Designs’ low-cost, gravity-fed drip-irrigation lines. An early-November walk along an earthen path in Wakouktaw led around the edge of a paddy—the monsoon rice heavy and ready for harvest—to the small, trig plot where U Win Hlaing and his wife, Daw Than Than Sein, have grown cash crops for the past 22 years: glossy eggplants, beans trained to delicate bamboo poles, water spinach, herbs. Their Ayeyarwaddy River Delta village in Kungyangon township lies about 35 miles southwest of Yangon, Myanmar’s largest city and commercial center: a couple of hours of rough driving on the country’s notorious roads. But U Win Hlaing and Daw Than Than Sein are doubly fortunate. Their farm is near the paved road and close enough to a town so that by rising at 3:30 a.m. she can market their produce directly, for higher prices than middlemen offer. And in a country where three-quarters of households lack electricity, they are among the rare recipients of government-supplied rooftop solar collectors, the power source for a few light bulbs in their bamboo dwelling. None of those comforts, however, offset the brutal reality of watering crops under the tropical sun. For most of their years of farming, U Win Hlaing shouldered a wooden yoke, climbed an embankment, clambered down a steep, muddy bank to the creek, filled two large sprinkling cans with water, and ascended to his rows of thirsty plants: 140 round trips each morning, repeated each afternoon, bearing several tons of water daily. A few years ago, he learned about a new technology: a treadle-operated pump that can lift water from the creek and send it to a collapsible 250-gallon “water basket,” made of PVC-impregnated vinyl. From there, hoses distribute it to the crops. On installment, he bought the pump ($17) and basket ($23). Now, with a few hours of work, he dispatches all the water he needs. Freed from exhausting hours of hauling water, he used that time and energy to double the area the family leases, to an acre; expand to three crops a year; and diversify what they plant (adding cucumbers and beans). Their income, he said, has risen fivefold, to $1,500 a year. Beyond expansion, that income funds the elemental security that eludes the poor, in Myanmar and elsewhere, who somehow subsist on $1 per day. The family can now buy six to eight bags of rice (a year’s supply), rather than having to purchase it day by day, and can even invest: purchasing rice at low harvest prices, and selling later, when the market has bid up its value. They can afford to support their son Pyi Sone Phyo Aung, age 16, now a monk, and to educate their younger son, a sixth-grader, paying for books and a uniform; their daughter, Win Win Thu, age 21, born in leaner times, had to leave school after fourth grade. If their progress continues, the family hopes to buy its own land. In the meantime, they share delicious eggplant salad, from their own field, cooked over an open fire behind their home. 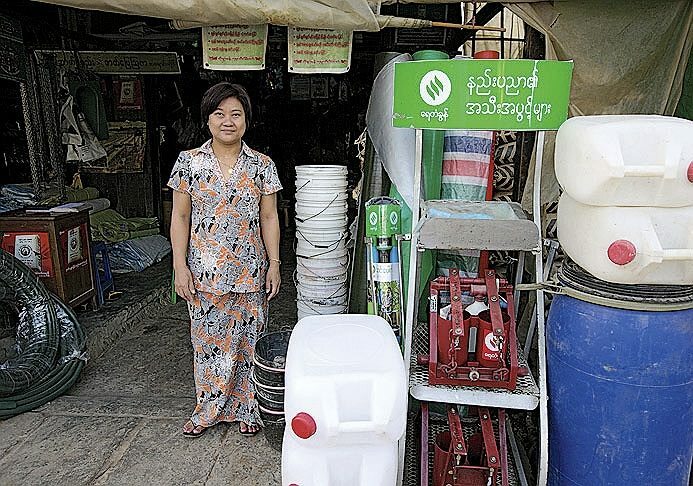 Every step of the way, that irrigation equipment is the tangible handiwork of Proximity Designs , an acclaimed social enterprise, based in Yangon, founded a decade ago by Debbie Aung Din Taylor and Jim Taylor, both M.P.A. ’90. Each element in the organization’s identity is meaningful. Its approach is predicated on discovering villagers’ most pressing needs first-hand—on proximity to the 70 percent of Myanmar’s perhaps 55 million people (no one is certain: the last census was three decades ago) whose livelihood is agriculture. As a social enterprise, not a charitable or aid entity, Proximity considers those it serves customers—people (as Jim Taylor emphatically put it) who are owed empathy, not sympathy, and who expect a return on their investment and a say about the value they receive. In an economy that has since the 1962 military coup starved Burma (as the country was then known) of investment, infrastructure, innovation (witness those yokes and watering cans), and even rudimentary seasonal financing for seed and fertilizer, Proximity Designs sells income-boosting products and provides credit and agricultural advisory services to farmers cut off from every one of those essentials. Proximity intends to replicate U Win Hlaing’s story, multiplying it village by village and changing thousands of lives in Myanmar’s countryside. Thoroughly businesslike, it maintains open, Silicon Valley-style offices on New University Avenue (east of Yangon University’s largely closed campus, the American Embassy, and the house where the National League for Democracy’s Daw Aung San Suu Kyi was kept under arrest for 15 years between 1989 and late 2010). There and on its website, it keeps a running count of families helped each month. Cumulatively, the data collected from impact assessments tally more than 180,000 households using Proximity’s products or services, and some 133,000 product or crop loans. Debbie Taylor notes that 740 irrigation products were sold in U Win Hlaing’s township during the last fiscal year. For all the Taylors’ strategic vision and business discipline—setting up shop in 2004 as the Myanmar outpost of International Development Enterprises (now iDE), a nonprofit aimed at alleviating rural poverty through appropriate technologies; then adapting those technologies and their operations to the local context as Proximity Designs in 2008—reality intervened to change their course. The horrific interruption was Cyclone Nargis’s violent course across the delta that May 2, killing 138,000 people and sweeping away the homes, crops, and draft animals of many of more than two million villagers in the most devastated townships. As staff members reported on the catastrophe (canals were too choked with corpses to navigate), Proximity became a de facto disaster-relief organization. Prototype water baskets were rushed into production to hold potable water (most of which is collected from roofs and channeled to enormous ceramic storage vessels beside each home—suddenly vanished); tarps were distributed for impromptu shelter. Proximity also became a conduit for international aid, focusing on food and, particularly, replacement seed, fertilizer, and tillers in time for the July rice planting. Two cyclone-relief developments have shaped Proximity’s subsequent strategy. First, it worked with community-based organizations to distribute relief equitably and transparently to rural households. Second, recognizing the need for support for farmers during the offseason, and for landless laborers, Proximity directed donor funds to small-scale infrastructure (a Myanmar equivalent to the fiscal stimulus then being applied in the recession-wracked developed world). By paying villagers to build secure pathways, safer bridges, and canalside jetties, the projects—the residents’ own priorities—boosted the economy while bettering future conditions by easing access to schools, markets, and shipping. Proximity’s emerging focus on services (seasonal $125 crop loans and other rural credit, agricultural advice), and its use of those community organizations as sales channels, derive from the improvised responses to Nargis. Another dozen miles from Yangon, in Dedaye Township, a wide canal intersects the road. From there, it is a 40-minute ride by motorized boat (a luxury for most villagers, who must propel themselves) to the shaded landing for A Phaung Gyi. Around an open-sided community hall, finger canals excavated in all directions are banked by heaped-up soil on which banana and coconut-palm orchards rise, screening the scattered houses from the sun. A kilometer-long footpath (the embankment for the community’s rice paddies), built in 1983 but subject to monsoon flooding, has been reinforced and raised for year-round use as a post-Nargis Proximity project. 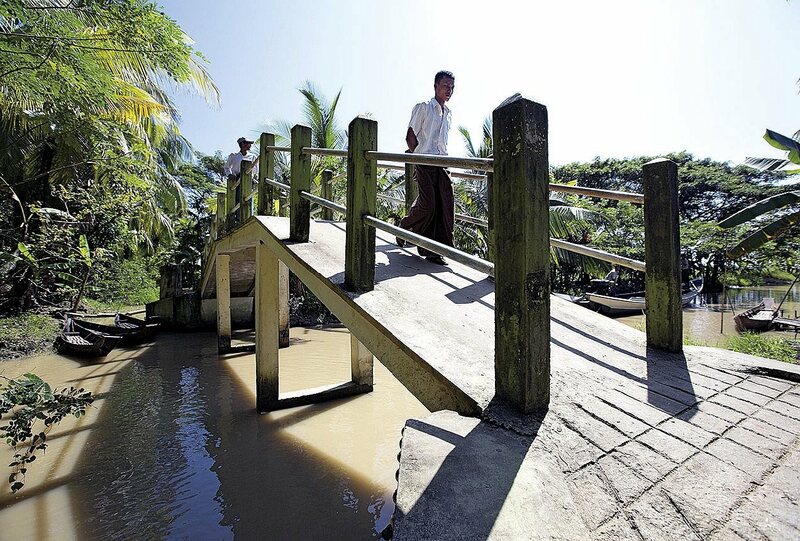 At the next major canal, where the crossing was once a single bamboo log, dangerous to traverse, Proximity funds supported a new concrete bridge, strong enough for motorized cycles to use, safe enough for children to get to school unassisted. After a narrated walk along the path, members of the three villages involved gather at the hall, its floor covered by a sturdy U.S. AID tarp, graciously topped with a woven mat for visiting guests. 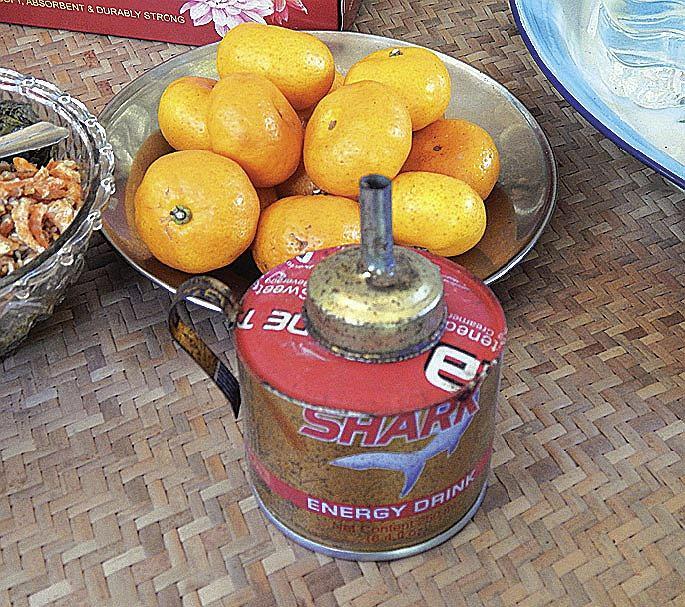 Over fresh coconut milk, tea, cans of Shark energy drink, bananas, tangerines, baked goods, salads, and cucumbers, U Soe Htet, an elected village leader, moderates the conversation. He talks about how 150 farming households (the other 220 are landless, a surprisingly high proportion and a sign of economic stress) shared seed, fertilizer, and common tillers distributed by Proximity after the cyclone. Other speakers describe subsisting as farm laborers three months a year, and fishing, crabbing, and gathering food from nature. The village is too remote for commuting to casual day jobs elsewhere—so people are migrating in search of work in Yangon. As roosters crow and the ubiquitous dogs bark, the talk turns to credit. Farmers have used six cycles of crop loans: repayment is nearly universal, Debbie Taylor says, because borrowers know they will need access to credit again for the next season’s planting. Can unsecured loans be made available for other purposes? villagers ask. That is the great unsolved problem in developing-country rural credit, she notes: the small loans cannot be effectively underwritten, but perhaps technology could help; small equipment or livestock could serve as collateral; and the community-based organizations could become involved both in securing the credit and servicing collections. Proximity Finance and other entities are exploring such issues around the world. Like 90 percent of Myanmar’s rural households, these villagers are far off the grid, and beyond the reach of the solar-panel program. How many people have acquired Proximity-distributed solar lights (created and manufactured by San Francisco-based d.light, another social enterprise shaped by the Stanford extreme-affordability design course) since they became available last year? A big show of hands ensues, and a chorus of enthusiastic endorsements. The lights—a hockey-puck-style unit retailing for $10.50 (payable in several monthly installments), a larger hand-held light, and a sort of standing lantern—dispel the darkness in place of thin candles (a continuous expense, a real fire danger in bamboo and palm-frond structures, and incompatible with mosquito nets) or even more costly diesel fuel. The lights have replaced diesel generators for threshing after dark, people report—a cost saving of 6,000 to 7,000 kyat (about $7) per night. A duck farmer says that his fowl, which are calmed by light after sunset, are better served by solar light than by the diesel burners fashioned from repurposed Shark beverage cans, or candles costing 50 cents nightly. Compared to inverters running off car batteries (which themselves need recharging in town), solar fixtures are also better for charging cell phones. Then the conversation takes an unexpected turn. What can be done about a sudden infestation of palm-sized snails that are devouring the rice crop? The news disquiets Taylor. Myanmar lacks public farm-extension services, and Proximity’s few dozen agronomic agents (who provided critical help when a new plant pathogen spread after Nargis) are spread elsewhere across the country. The farmers explain that they have plucked as many as 20 large baskets of the snails per acre of rice in a single evening; the pests destroy the plants in as little as two days. Alarmingly, they have spread to five nearby villages. Proximity’s photographer takes pictures of the snails to share with its expert farm advisers. A smart-phone app under development (anticipating deployment of mobile-phone infrastructure in Myanmar during the next two years—“to extend traditional agricultural extension,” as Jim Taylor put it) aims at addressing just this sort of pest crisis quickly and cheaply, Debbie Taylor notes—part of its larger evolution from products to services. But today, any solution lies long boat rides and drives away, with the staff in Yangon or farther afield. In the meantime, the farmers’ only defense is trapping or plucking off the snails by hand. 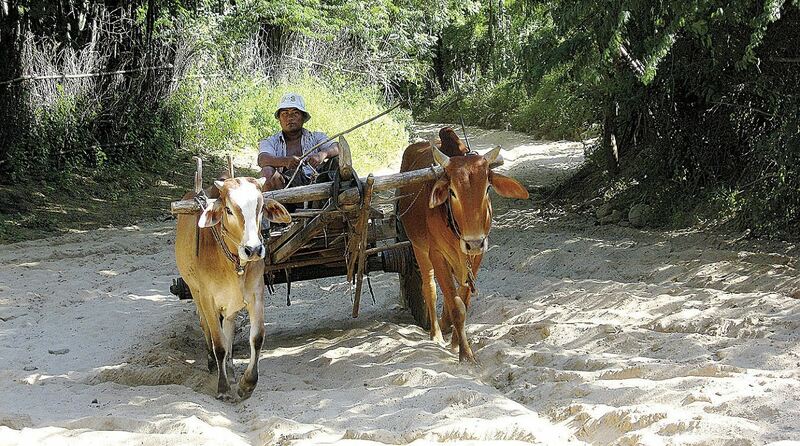 Even as Proximity makes such village-level discoveries, and enables individual farm households to become more productive, it is engaging the larger policy issues that face every aspect of contemporary Myanmar. When the generals took over, they suppressed both democracy and the aspirations of the ethnic groups who comprise one-third or more of the population for some federal sharing of governance and resources. The military progressively appropriated most economic activity. (As The New Yorker’s Evan Osnos ’98 reported in a dispatch from the 2012 elections , in a nation where per capita cell-phone ownership trailed North Korea’s, Senior General Than Shwe, the ruler from 1992 to 2010, “once considered spending a billion dollars to buy Manchester United as a gift to his grandson, a soccer fan.”) Some of the ethnic areas, in turn, are not so much governed as run by armed militias, which exact funds from smuggling, tolls, and other “distributions.” Countrywide, powerful elites have enriched themselves by exploiting natural resources (what economists call the “commodities curse”) that, properly shared, could pay for Myanmar’s desperately needed development. The Taylors, running an apolitical social enterprise, are perhaps uniquely poised to proceed down both paths at once: working with individual farm households under extremely challenging circumstances and raising policymakers’ sights as they encourage nascent civic life and the return of private enterprise in a place that has effectively had neither for decades. Debbie, Burmese by birth, was educated around the world as her father, a forester, undertook assignments for the United Nations Food and Agriculture Organization. After she graduated from Middlebury College and Jim from the University of Washington, they met in 1978 while working on rural health clinics and urban revitalization in the Mississippi Delta. From there, married, they moved to Cambodia in 1985 as country directors for the Mennonite Central Committee: two of the first six Americans in Cambodia helping it begin to right itself after the Khmer Rouge holocaust. As they tried to rebuild shattered health systems and irrigation, and to launch rural industries, they came into contact with policy analyst Thomas Vallely , then Vietnam program director for the Harvard Institute for International Development (HIID, a development-advisory service)—and realized the value of an education in policymaking. Following their Kennedy School stint, they redeployed to Indonesia for seven years, where both were economic policy advisers—and where Debbie began engaging with Myanmar under the auspices of the United Nations Development Program (UNDP, sometimes with HIID economist David Dapice ) and later the World Bank. During several subsequent years in California, Jim earned an M.B.A. and worked in business and as an entrepreneur, and Debbie focused on being a soccer mom to their two children—while continuing to visit her increasingly isolated homeland for the UNDP and World Bank. In 2003, the couple decided they had “the emotional energy for one more country,” Debbie Taylor says—and moved their family to Myanmar the next year. The Nargis recovery efforts made clear just how precarious families’ finances actually were, in an economy that provided minimal credit, if any—forcing farmers to use inferior seed, forgo fertilizer, or resort to moneylenders (where available) who charge usurious monthly interest rates of 8 to 10 percent. The systemic causes of rural poverty loomed large. In response, since 2009, drawing on the relationships the Taylors established two decades earlier, Proximity, in part with funding from the Royal Norwegian Government, has engaged development experts at the Kennedy School’s Ash Center for Democratic Governance and Innovation —themselves steeped in frontier environments throughout Asia—to examine the most pressing questions. In a series of 16 papers so far, available online in English and Burmese , they have studied technical topics such as the scarcity of crop loans and the country’s then-ruinously overvalued exchange rate (effectively an export tax on rice-growers and manufacturers). Given the political opening-up during the past three years—Daw Aung San Suu Kyi ’s release from house arrest; the National League for Democracy’s recognition as a political party and sweeping victory in limited 2012 parliamentary elections; relaxation of international sanctions; President Barack Obama’s visit—the research has broadened, at the request of policymakers working through the quasi-governmental Myanmar Peace Center in Yangon (Bill Clinton and Tony Blair both visited in November). Recent papers have addressed peaceful engagement with the ethnic groups, following civil wars dating as far back as 1948; governance; exploitation of valuable natural resources; and a more equitable relationship with China, Myanmar’s most important neighbor, investor, and customer (for jade, natural gas, teak, and, prospectively, hydroelectric power). Dapice, an Ash Center affiliate who is also on the Tufts faculty, and Vallely, now senior adviser for mainland Southeast Asia, bluntly summarized the challenge in a paper published last March: “Fifty years of military rule, poor policies, and sporadic conflict have left Myanmar in the bottom half of the bottom billion people in the world.” Rising higher will not be easy: in the recent World Bank “doing business” index , Myanmar ranked 182 out of 189 economies—below Zimbabwe and Haiti, and above only such iconic disasters as the Congo, Eritrea, and South Sudan. The country’s problems extend beyond “reform” to transforming its elite-dominated political economy and addressing the challenges of nation- and state-building. When Dapice, conducting Proximity-Ash Center research, needed to understand precisely how farmers could afford to plant, or why they could not (the national agricultural bank lending limit in 2009 was 8,000 kyat per acre, less than a tenth the cost to sow and fertilize rice), Debbie Taylor arranged detailed conversations with the growers. He is, she says, an extraordinary “detective” economist, able to collect information and to build a macroeconomic perspective where reliable data are nonexistent—a classic “muddy waters” economist (a high compliment). Dapice and Vallely have challenged the seemingly inflated official reports of Myanmar’s economic growth, and pierced the secrecy surrounding the lucrative, largely off-the-books jade trade. When they have consulted with officials—initially to gain access for research, subsequently to gauge the policy options—the Taylors, experienced in analysis and attuned to Myanmar, have been able to supply context and to make contacts across the political and governmental spectrum. Vallely and Dapice have engaged other Harvard experts, too. José A. Gómez-Ibáñez, Bok professor of urban planning and public policy at the Graduate School of Design and the Kennedy School , reviewed Yangon’s physical development. Dwight H. Perkins, Burbank professor of political economy emeritus and former director of HIID , assessed industrial policy. Perkins, perhaps the dean of Asian-development experts, recently summarized his half-century of work in East Asian Development: Foundations and Strategies (Harvard University Press) . While explaining the processes of sustained high growth in much of the region, the book has almost nothing to say about the two counterexamples: North Korea and Myanmar. Perkins notes that even China, after its Maoist disasters, and Vietnam, a rigid party state, effected real economic change and sustained, rapid growth that have lifted hundreds of millions of people out of poverty. But they began their turn to the market with party-built infrastructure, administrative systems, large (if inefficient) enterprises, and education in place, and relative equality. Myanmar has none of these attributes. Yet Perkins maintains that if political reform progresses, Myanmar, too, could start the process of fast “catch-up” growth, beginning with export-oriented industries fueled by foreign investment and gains in agriculture of the sort Proximity Designs enables. With the right policies, outlined in his April 2012 paper for Proximity, Perkins envisions growth of perhaps 8 percent per year, doubling incomes in the coming decade. Getting those results depends on peace—and on building indigenous expertise. Now, he says, everyone in Myanmar is “starting from near tabula rasa in terms of knowledge about how to do this.” Therein may lie an opportunity for further Harvard-assembled expertise. In October, Kennedy School dean David Ellwood ; Ash Center director Anthony Saich, who is Daewoo professor of international affairs ; Vallely; and the center’s Vietnam program director Benjamin Wilkinson  traveled in Myanmar. With Proximity, they visited villages on foot and by ox cart, Ellwood recalls. They met with government officials and other parties. Although much is unresolved pending the 2015 national elections, the dean notes, Kennedy School experts might work to bring together members of the opposing sides in some of the state and ethnic conflicts that have divided the country for so long—deepening research on the issues and resources available to bridge them, training participants in negotiating and governance skills, and building the conditions for political dialogue. Saich and the school have long been involved in training officials from China and Vietnam, and now from Indonesia, too, with exchanges between each nation and Cambridge. Myanmar’s fierce internal conflicts and its deteriorated educational institutions may preclude launching formal, academically based programs immediately. But this winter, Vallely and Dapice foresee further research with Proximity on economic and policy problems in Rakhine State, where Buddhist attacks on Muslims have left villages and mosques in smoking ruins and sent tens of thousands to refugee camps. 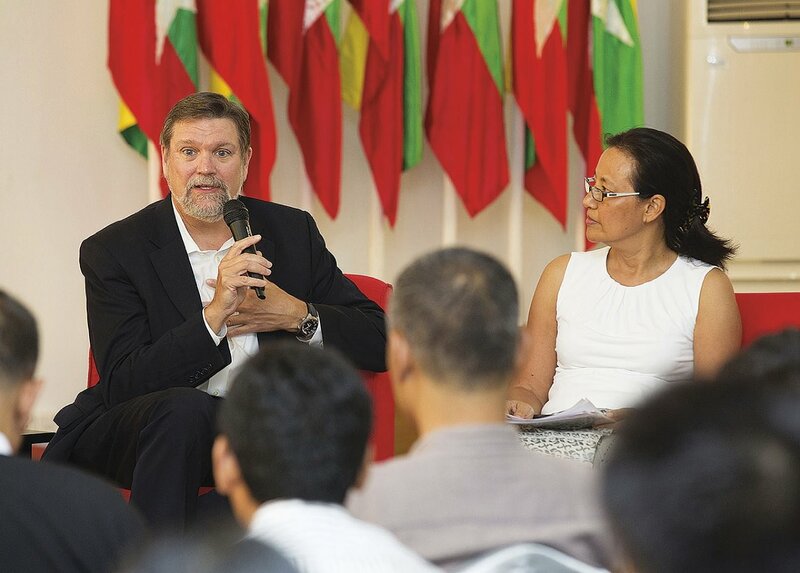 In the near future, Vallely hopes experts from Harvard, Vietnam, and elsewhere can offer training programs to help Myanmar participants learn how some of their Asian neighbors have fruitfully connected economic and political reforms. Here, in the central Dry Zone, farmers struggle to produce crops with one-eighth the delta’s annual rainfall, or even less: their ox teams pull carts along sandy tracks, alongside cactus hedgerows. 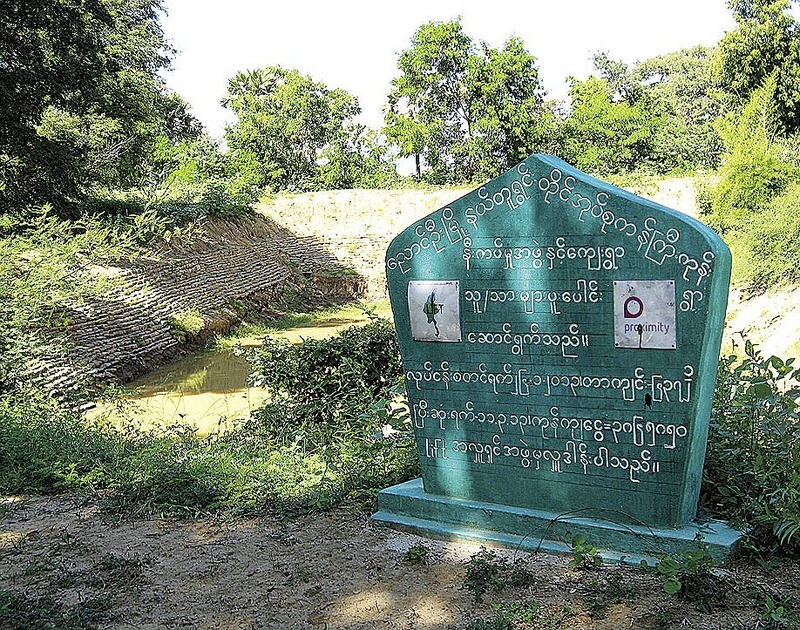 In the hills east of Bagan—the flourishing kingdom where Theravada Buddhism became ascendant from the eleventh to the thirteenth centuries, leaving a vast plain of temples and monuments, today’s tourist attraction—Proximity’s Farm Advisory Services is establishing a presence in Nyaung-U township. Yarzar Naing Win, an agronomist trained in Myanmar, points out a demonstration windbreak that protects a field of lentils and cattle forage from the scorching winds, helps to retain critical moisture, and promises a source of future firewood. Proximity paid local farmers 2,000 kyat, the going rate for a day’s work, to plant the seedlings three years earlier. Past fields fringed with palms (a source of food, sugar, roofing materials, and sap fermentable into liquor), a modest valley descends down a dirt road lined with agaves toward Kangyikone village. While the delta rebuilt from Cyclone Nargis’s flood surge, the Dry Zone cruelly suffered an extended drought, so here, too, Proximity extended aid funds for infrastructure projects. Villagers built a trap for silt and dug out and lined the pond beyond that provides their drinking water during the first part of the dry season—reducing by a month the period during which they have to push barrel-mounted carts up the road to buy water from the nearest pumped well. In an area where family income averages perhaps $500 to $700 a year, working on the project earned each household an extra $36 in wages. Inside the monastery at the village center, U Thu Nanda, the abbot, offers apples, tangerines, water, pastries, and peanuts—the local crop—to accompany conversation. Given demand from the three villages that share the water, the first question asked concerns the potential to enlarge the pond’s capacity. During the past three seasons, Yarzar Naing Win has introduced the practice of planting a “green manure” crop to enrich the soil and retain moisture between peanut harvests. It is not an easy sell: the technique requires an extra five days of cattle-powered plowing and seeding during a normally fallow period after the harvest, when the farmers cherish their rest, too. Yarzar Naing Win illustrates the process with a simple video on his tablet—something farmers can see, without having to travel to another village to observe. Yet those who have adopted the technique are enthusiastic. A walk through the modest village passes carts full of peanuts awaiting hand-picking from the attached plants. 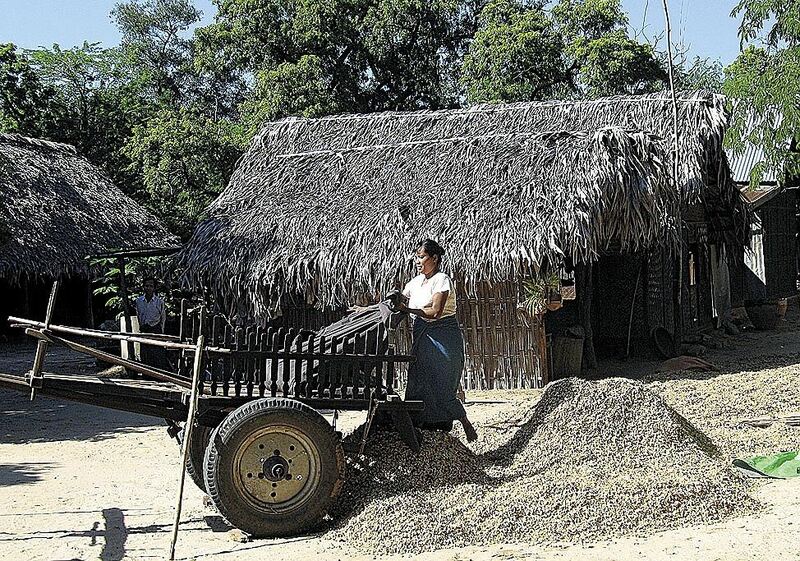 If the rainfall is plentiful and well-timed, says one farmer, U Pawka, he can harvest 50 large baskets of peanuts in the shell from an enriched acre—twice the yield from traditional cultivation. Sold for 700 kyats per basket in the market town, 10 miles distant, a successful crop brings in about $35 per acre. Landowning families’ parcels average eight to 10 acres; perhaps 10 households till larger plots. But most households are landless—explaining the migration of many families to more promising parts of the country, and to Thailand and Malaysia. And far to the south, where Ayeyarwaddy delta rice paddies suddenly seem to provide a lush life compared to the harsh constraints of the Dry Zone, Proximity Designs’ business of boosting incomes, farmer by farmer, also continues apace. U Win Hlaing accompanies visitors as they walk from his precise rows of eggplants and greens to U Myat Thein’s one-acre cornfield. As he shows his tube well and generator (and as ears of corn cook inside his home for his guests), U Myat Thein, a village sales agent for Proximity products, says the corn crop brings in more income than 10 acres of rice. The returns have justified, and been enabled by, Proximity’s newest product, drip irrigation: hoses that run down each crop row, delivering water through tiny tubes to the roots of each plant. Unlike the foot-powered pumps and water baskets, this is the state-of-the-art technology for hot-climate agriculture in the developed world. Deploying it in Myanmar took exacting design to effect gravity-fed distribution of the water, given the pervasive absence of power. Getting it adopted is in some ways even more challenging: in many farmers’ eyes, the costly system ($36 per quarter-acre) seemingly cannot deliver enough water to work, especially compared to twice-daily soakings from a sprinkling can or hose. As U Myat Thein talks, U Win Hlaing picks up one of the connector tubes from a bucket, turns it over in his hand, eyes the tiny opening, and then puts it up to his mouth. He blows through the tube, feels the air come out into his open palm, gives it another thorough looking-over, and then gently places it back in the bucket. Thus does technology transfer proceed: come next season, Proximity can likely log another sale, and another farm family’s income increased, in Kungyangon township. For more information, see www.proximitydesigns.org . The Ash Center’s Myanmar program is described at www.ash.harvard.edu/Home/Programs/Institute-for-Asia/Myanmar-Program . The “research” link there provides access to all of the papers published by the scholars who have examined the country’s economy, agriculture, governance, and policy matters.